Let me transform your boring ceiling into the most beautiful starry night sky you will ever see! "Thank You! What a relief...it was well worth the price as I had hoped!" Chris A. March 2018 Status: Current Limited Availability. Relax Under the Stars Every Night! Stargazing in bed IS possible! Each and every night, a beautiful night sky awaits you! You're about to discover the secrets to Relaxation, Inspiration, and Romance...not to mention a Great Night Sleep! My mural paintings are great for Adults, even better for kids! EVERY Kid LOVES Stars! My Cosmic Rooms are an Excellent choice as a mural for kids rooms because it will grow with a child through the many themes and stages of their development. Starscapes®, the Original 3-Dimensional Glow-in-the-dark Ceiling Mural of the night sky, with thousands of realistic looking stars! 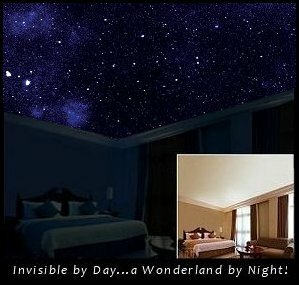 Virtually invisible during the day, simply flip off your lights at night and gasp at the amazing view of the universe high above you...it's as though your regular ceiling has been removed and replaced with a glass ceiling! An exquisite Trompe L'oeil masterpiece based in the tradition of Old World fresco artists; it's truly a Magical, One-of-a-kind Experience that will take your breath away! Hi, my name is Jean Eng and I am the Local Starscapes® Artist-Illusionist for Maryland and surrounding areas. Without revealing any Confidential Proprietary Information, I am a mural artist who paints stargazing ceiling murals in your home or business. Utilizing a Top Secret Process, I am able to replicate the mystery of the night sky as it was meant to be seen, untainted by smog, unobstructed by city lights, the vast universe in all its glory just for you, your very own "Personal Night Sky", if you will! Each star is custom painted by hand and are unseen during the day (virtually invisible) or when room lights are on but at night, thousands of stars appear, as if by magic, to create a 3-dimensional view of the most amazing and inspiring starry sky you have ever seen! Click the images below for a quick look at some star-filled rooms. You too can have this "One of a Kind" Stargazing Ceiling Treatment installed in your home today. Not only is this a wonderful way to ease stress and relax you while you drift peacefully to sleep...a Cosmic Rooms Mural is also a fantastic conversational piece! Show it off to family and friends and have them oohing and aahing at your masterpiece and wishing they had one in their own homes as well! Easing Sleep Insomnia Inspire Learning Night Light for Kids Gift Giving Soothing "fear of the dark"
"Nice Job! Looks great! It really DOES look like the nightsky when we go camping out in the mountains! Can't wait to show this to my boyfriend so we can *romance* under the stars tonight!" Lisa P.